On the whole, the Garmin Echo 200 Fishfinder is ideal to be carried to any fishing trip. It works excellently in deep as well as shallow water. 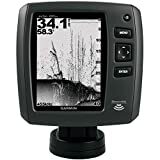 This model has the ability to search prey within a maximum depth of 1500 ft, however, despite boasting a 5-inch 480 x 320 high-resolution grayscale display, its only drawback is the absence of a backlit display, which can sometimes cause disturbance in the fishing experience. Other than this, it is a superb device for targeting fish effectively, when the sun is bright. Are you tired of looking here and there in the hope of spotting some fish to catch during your fishing adventure? Do you wish to own a sturdy device for this cause? Well, here it is! You can now save your time and energy by getting your hands on the Garmin Echo 200 Fishfinder. The Echo 200 is a small handy device that is bound to make your fishing experience fun and pleasant. Although, it is compact in size, but the phenomenal features of this tool are worth your investment. The best thing about this model is that, it won’t cost you an arm and a leg. The Garmin Echo 200 Fishfinder is a versatile fish finder manufactured by Garmin – a well-known brand for producing quality products. It is easy to operate and convenient to use, thanks to the powerful 300 watts (RMS) high-sensitivity sonar and a 5-inch display. Although, it has a grayscale display, but the device helps the users to observe details that they might not have imagined. Due to the model’s exclusive HD-ID target tracking technology, you no longer have to engage yourself in guesswork of where to cast your fishing line because the device will get you a clear picture of everything present underneath your boat. So, instead of spending time hovering over empty waters, you can directly reach the spot where the prey freely dwells just by a push on a button. Moreover, it includes a dual-beam transducer that can scan water as deep as 1,500 ft, and since the unit has a wide scanning angle of up to 120 degrees, it is also ideal for shallow depths. Worried about the cost of such an efficient gadget? Don’t be! This fish finder provides you quality performance at a very affordable price. Besides, installing this device is a task of merely few minutes because it comes with a quick-release tilt mount and a transom-mount transducer. Moreover, once set up and running, the smooth scaling technology prevents sonar data from getting interrupted as the unit changes depth ranges. It even enables the user to rewind sonar history for any missed points or future use. This model is incorporated with high-quality components to make it long-lasting and durable.